During Pixar Fest through September 2018, you can have a special afternoon tea experience at Disneyland Resort. 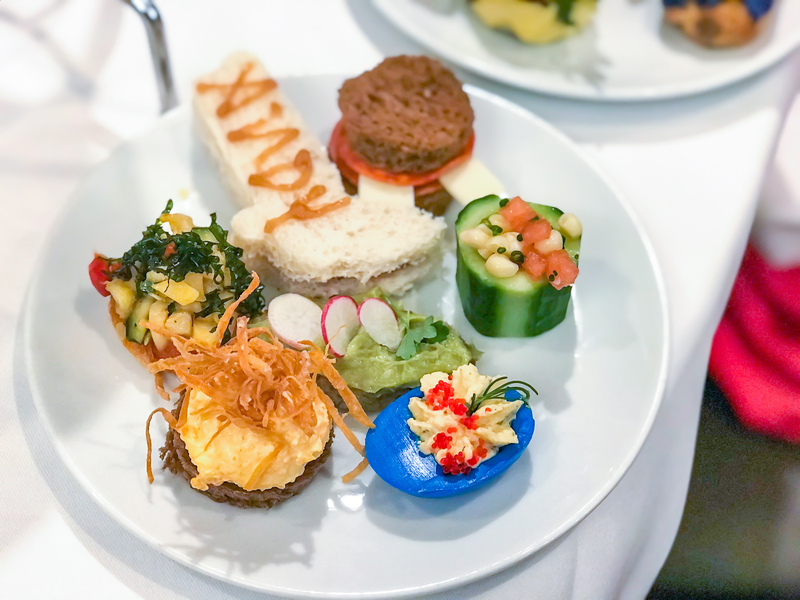 At Disneyland Hotel’s Steakhouse 55, you can book a Pixar themed tea on weekend afternoons. For the tea, you can select the classic tea ($52 per person) the premium tea ($65 per person), or the Kids tea ($35 per person) – and good news, annual passholder discounts apply! For the tea party, I Disneybounded as Bonnie from Toy Story 3, and Amelia Disneybounded as Mrs. Nesbit from Toy Story. My husband Disneybounded as Woody! For the classic tea, you receive unlimited iced or hot tea, an assortment of tea sandwiches, tea desserts, and 2 small scones. For the premium tea, you get sparkling wine, a souvenir Remy straw, and an Inside Out themed salad in addition to the scones, sandwiches, and desserts. For the classic and premium teas, the sandwiches include an avocado toast (inspired by the green aliens), toast with veggies on top (inspired by Ratatouille), toast with carrot cream cheese (inspired by Merida), and a blue and yellow deviled egg (inspired by Dory). The tea desserts include a grape soda eclair, chocolate covered strawberry (inspired by Up), blackberry marmalade cupcake (inspired by Sully), and cheesecake (inspired by Ratatouille). All of the adult tea sandwiches and the deviled egg are vegetarian, if you request no caviar on top of the deviled egg. For the kids tea, kids can choose tea (iced or hot), milk, hot chocolate, or juice. The tea sandwiches are PB & J (in the shape of Woody’s boot), pepperoni and cheese (that looks like a monster mouth), and watermelon and cucumber sandwich. The desserts are a chocolate covered strawberry (inspired by Woody), and the same eclair, cupcake, and cheesecake as the adult tea. If you have dietary restrictions, be sure to mention it upon check-in. While they don’t have a separate allergy menu, they can accommodate allergies and gluten-free diets upon request. Other special touches for the tea are the centerpieces on the tables (subtle centerpieces that are Pixar inspired, I saw a Finding Nemo one, an Up one, and a Toy Story one. I also love that the waiters will tell you the names of all the treats as they serve them, as well as the inspirations behind them! This tea was a Disney-lover’s dream come true, and was definitely worth the price. I can’t recommend the experience enough, it’s my absolute favorite part of Pixar Fest. You can find reservations here. Everything looks so colorful! I’m not sure when I’ll be back but I hope they do another themed one of these! Looks fun!